Novation have cut the keyboard and the cost with the latest addition to their Remote SL line of 'intelligent' hardware controllers. 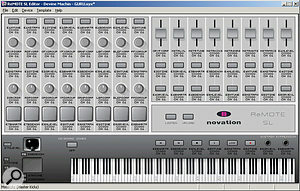 The February 2006 issue of SOS saw Derek Johnson heaping a fair amount of praise on Novation's Remote 25 SL MIDI controller keyboard. The '25' in the Remote 25 SL's name signifies the number of keys on the keyboard. The other two models in the Remote SL range offer 37 or 61 keys. What we have under review here is the Remote Zero SL, another variation on the same theme. It's functionally almost identical to the other models in the Remote SL range, except with no keys at all (hence, Zero). The answer is that Novation's Remote SL range offers a lot more than just keys. Knobs, buttons, sliders and even drum/sample trigger pads are all on board, and all freely assignable to parameters on just about any hardware device or software program capable of speaking MIDI. Add to these Novation's very clever Automap technology, which aims to make the business of controller assignment as painless as possible, and the Zero SL begins to look really rather useful, in spite of its keylessness. Keys aside, two other missing features are the pitch-bend/modulation joystick and X/Y touchpad usually found at the left-hand end of the Remote SL keyboards. To be fair, the joystick probably wouldn't have been all that useful without a keyboard alongside it, but the touchpad would still have been worth having. The Zero SL is a pretty compact device, very slightly wider than a QWERTY keyboard, and a little less deep (468 x 68 x 163 mm). That said, there's not an inch of wasted space on it. The top panel is divided into two halves, each half with its own long LCD (two lines of 72 characters) running along the top. The left-hand half is crammed full of buttons, rotary encoders and pots, with a row of velocity-sensitive drum/sample trigger pads along the bottom. The right-hand half is home to more buttons (including sequencer transport controls), and a set of eight faders. On the back panel are four MIDI ports: In, Out and Thru, collectively labelled 'MIDI port 1', and another Out labelled 'MIDI port 2'. Plenty of flexibility here then — enough for some fairly complicated combinations of MIDI software and hardware, without the need for a separate MIDI interface. A standard USB port allows allows connection to a host computer. MIDI data can be sent to and received from applications and plug-ins, and the Remote SL can also draw power via USB (provided the bus can supply it). Alternatively, it can be powered by four 'C' sized batteries (if you're using rechargeable cells, these can be charged via USB). An external power supply is another option, although this is not supplied. Finally, there are control and expression pedal sockets, on quarter-inch jacks. The Remote 25 SL is a 'class-compliant' device, meaning it doesn't require any specific device drivers to be installed. You can just plug it in, and your computer should know more or less what to do with it (Windows will erroneously label it a 'USB audio device', but this is considered normal). Even so, an installer program does need to be run to set up Automap functionality (this is supplied on the install DVD, although it's a good idea to download the latest version from the Novation web site). Also included is a collection of software known as Xcite Pack. This includes a 'Lite' version of Ableton's popular Live audio sequencing application, which, despite being feature-limited, is quite usable, and is also compatible with the Zero SL's Automap features (of which, more later). Novation's excellent Bass Station plug-in synth is included too, along with limited demo versions of FXpansion's Guru and BFD percussion instruments and a collection of almost 500MB of Loopmaster samples. The Zero SL comes with several dozen pre-installed templates for controlling popular software and hardware. Soft synths by Novation, Native Instruments, Gmedia and Arturia are supported, among others, as are host applications including Cubase, Nuendo, Logic and Live. For a complete list, see www.novationmusic.com. Needless to say, you aren't limited to using only preset templates: you can create your own. The Zero SL's large LCDs and logical menus make this relatively easy. 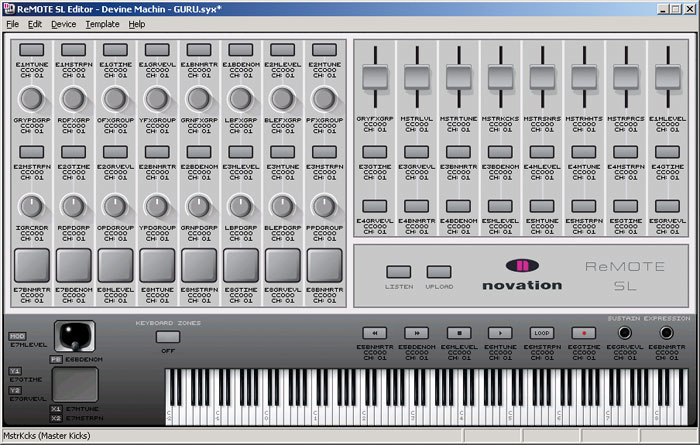 However, it can be made easier still by downloading the Remote SL template editor application (shown in the screenshot below), which is available as a free download for Windows and Mac OS X from the Novation web site. How The SL Does It Work? The Zero SL works in much the same way as the other SL models. There are four main operating modes. You'll most often be in Play mode, using the SL's knobs, buttons and sliders to adjust parameters on your MIDI hardware or software. In Edit mode, you can edit the MIDI data sent by individual controls. Template mode allows you to make changes affecting an entire template, while Global mode allows you to make changes affecting the behaviour of the whole unit. Despite its sophistication, the Zero SL is very easy to use in practice. The preset templates make working with common instruments close to effortless. Simply select the desired template, and you'll immediately find the instrument's parameters mapped out across the SL's controls. Very sensibly, the same kinds of parameters tend to be assigned to the same controls, even for different instruments. This means, for example, that amplitude envelope controls can usually be found in the same place, regardless of what synth you're using at any given moment. Automap makes things easier still. Assuming you're using one of the supported applications (Cubase, Nuendo, Reason, Logic and Live, among others), you should need only to select an instrument within the host and the SL will detect it and automatically update itself with the appropriate parameter assignments. Select another instrument, and it updates itself again, new parameter names appearing in the LCDs as if by magic. Some host application parameters (mixer settings, for example) can be controlled as well. Overall, the Remote Zero is impressive. I only have a couple of minor niggles. First, the freely configurable X/Y touchpad is one of the nicer features of the Remote keyboards, and it's a pity not to have it here. Second, although the drum/sample trigger pads work very well, they are a little on the small side for my liking. These small complaints aside, there's a lot to like about the Zero SL. It's well-designed, well-built, very flexible, and quite easy to use. There aren't many comparable MIDI controllers, and probably none that can match it feature for feature. Good design, with plenty of flexibility. Large LCD displays are clear and easy to read. Lots of knobs, buttons and sliders. Automap works well with supported software. The Remote Zero SL would be ideal for anyone who wants a flexible MIDI control surface, and who either already has a keyboard they're happy with, or isn't bothered about keyboards at all.